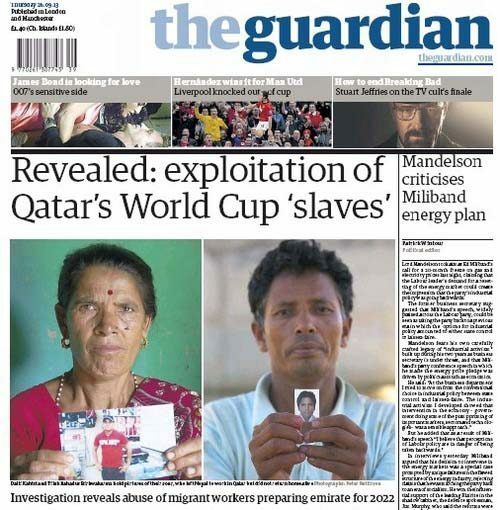 A leading British newspaper has run a front-page in-depth report and video examining the rising death toll of Nepali workers in Qatar. The Guardian’s report, put together by Kathmandu-based journalist and teacher Pete Pattisson, focuses on the plight of young men from Nepal who often take out huge loans to work in Doha, only to arrive here to find lower salaries and poor living and working conditions. The Guardian refers to statistics obtained from the Nepal Embassy here, which states that July was the deadliest month on record for Nepalese expats in Qatar, with 32 deaths in all. Most of the deceased were construction workers in their 20s who died of cardiovascular disease, an embassy official told Doha News last month. The report also includes a video with interviews of a Nepal-based family who wail as they receive the body of their child, a 16-year-old boy who obtained fake documents in order to secure a job in Qatar. He died just two months after he arrived in Qatar, apparently from cardiac arrest. That 30 Nepali men have sought refuge at their embassy in Doha, complaining of lack of pay and a failure of their company to process their residence permits. The newspaper has published responses from the Lusail Real Estate Development Company, the Qatar 2022 Supreme Committee, the Labor Ministry and engineering firm Halcrow, who are all featured in the Guardian’s report. The Qatar 2022 Supreme Committee previously told the paper that it’s “deeply concerned” about the allegations. “Like everyone viewing the video and images, and reading the accompanying texts, we are appalled by the findings presented in The Guardian’s report. There is no excuse for any worker in Qatar, or anywhere else, to be treated in this manner. Meanwhile, Qatar’s Ministry of Labor has responded by highlighting Qatar’s Labor Law, and the protection it provides to workers, detailing rules including the provision of water; restrictions on working during the hottest part of the day during the summer months; the provision of food and decent accommodation; and regular salary payments. You can read the full responses here.